Shopping for Star Wars Roleplay? Build your own lightsaber! The Lightsaber remains the quintessential weapon of Jedi and Sith across the galaxy. 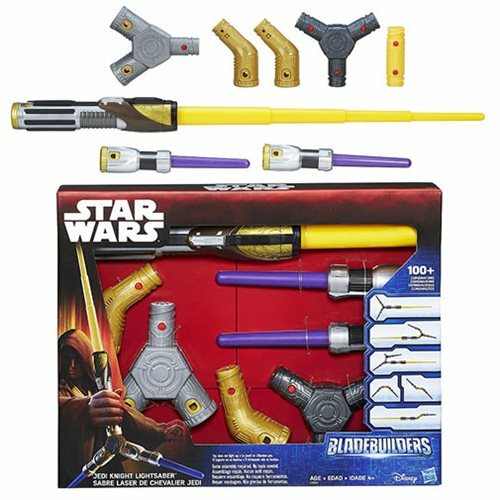 The Star Wars Jedi Knight Bladebuilders Lightsaber offers young padawans a thrilling Star Wars role-play battle experience with tons of additional accessories for complete customization. Compatible with all Bladebuilders lightsabers. Lightsaber measures approximately 19 1/2-inches long and miniature sabers measure approximately 5-inches long each. Toy does NOT light up. Ages 4 and up.